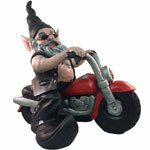 Add some mean muscle to your garden with our biker babe and biker gnomes. These biker pairs are sold individually but look great together. Our leather-clad biker gnomes will tell visitors that you mean business. 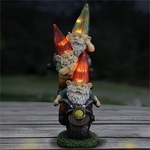 Whether you are a biker or just feel the need for speed, you will love our 15, 20 and 32 inch gnomes to fit your indoor or outdoor space. Our 15 inch styles are an awesome gift for any biker. This size is small enough to bring to the office but big enough to make a statement. Our 32-inch styles will be real showstoppers in your yard, taking your flowerbed to the next level. Choose one size or mix and match to enhance your indoor or outdoor space. Our biker babes come with a leather vest, bra and chaps over a painted pair of jeans and a studded belt, paired with a matching black cap and boots. These ladies have a studded choker necklace and bandanas tied around their upper arms to capture the biker look. Her black shades do more than block the sunlight�they keep your biker babe looking as tough as nails. You will truly transform your garden with these hell-raisers. 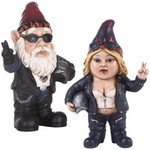 Don�t forget to purchase a matching male biker gnome to accompany your biker babe. Each biker gnome comes with painted leather chaps, a leather vest, gloves, boots and a black biker cap. 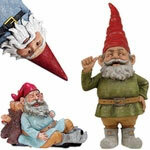 These Gnomes of Anarchy will complete your front path or backyard look. Our gnome statues come with a tough guy skull necklace to show visitors who protects your turf. Instead of adding sweet and innocent lawn gnomes to your yard, add some fun and mischief with our small, medium and large biker gnome figures. These GardenFun customer favorites are a perfect special occasion gift for the biker on your list!